The Enterprise spirals out of control. J.J. Abrams’ 2009 Star Trek reboot was an unexpected pleasure, taking a cult sci-fi series and revitalizing it in grand fashion, with spectacle, heart, and humor. Despite the enthusiastic welcome that the prequel/reboot (preboot?) received from fanboys, critics, general audiences, and even the Academy (the film won Best Makeup and received a total of four nominations), Abrams chose not to rush headfirst into a sequel. Four years later, with the follow-up finally hitting theaters, it’s clear that he made the right call by taking the time to think ideas for the next installment through completely, though evidently none of the deep thought thart the finished product shows went into a title (that’s right, no colon, no number, nothing). Quibbles aside, Star Trek Into Darkness is a thrilling, smart, imaginative, and satisfying sequel worthy of its respected namesake. With introductions out of the way, Into Darkness focuses on telling a great story with a terrific cast of characters. This time around, the crew of the USS Enterprise find themselves on a mission of retribution. After Starfleet officer John Harrison (Benedict Cumberbatch, of Sherlock fame) defects and commits a series of devastating terrorist attacks on Earth, Captain James C. Kirk (Chris Pine) and his crew travel to a war-zone planet in Klingon territory to capture him so he can face judgment for his crimes, unwittingly playing right into their enemy’s hands. As its title suggests, this Trek is grittier and more intense; the villain, topically, is a vicious terrorist with a murky agenda of his own. Corruption, sacrifice, politics, revenge, and betrayal all play roles in the story, while the darkness of the title also refers to the indecision and fears of the Enterprise’s crew, particularly those of Kirk and Spock. Harrison manipulates the crew into questioning their own morals, giving Into Darkness some added depth that elevates it high above typical sci-fi fare. All of the characters, not just those two, are really at the core of what makes Into Darkness work. Abrams doesn’t sacrifice character development for action, strengthening the crew’s connections and personalities even as he pits them against unimaginable odds. Lieutenant Uhura (Zoe Saldana) and First Officer Spock (Zachary Quinto) are struggling to make a relationship work as the story starts out. First Lieutenant Scotty (Simon Pegg) has serious moral quandaries with the Enterprise’s assignment, while Kirk grapples with his failures both as a leader and as a man. It isn’t all doom-and-gloom, however. The witty banter between Kirk and Spock is at an all-time high, and comedy relief characters Dr. ‘Bones’ McCoy (Karl Urban) and Scotty are both terrific in their roles, managing to capture the heart and soul of the Enterprise. The newcomers are also strong. Cumberbatch is a much more compelling villain than Eric Bana’s bland Romulan in the 2009 Trek, bringing a menacing gravitas and dangerous verve to the physically-imposing Harrison, a super-human with equal penchant for skull-crushing and monologuing (sometimes simultaneously). His scenes alongside Pine and Quinto hum with a nervous energy and are among the film’s best (and without giving any spoilers, die-hard Trekkies may go into hysterics when a great twist halfway through reveals him to be one of the Enterprise’s greatest foes). Pete Weller sinks his teeth into a sizable role as Admiral Marcus, head of Starfleet. Finally, the gorgeous, talented Alice Eve is a great addition to the cast as the admiral’s daughter Carol Marcus, a love interest for Kirk who will hopefully have a larger part in the series’ inevitable third installment. Abrams’ flair for visuals is used to great effect in Into Darkness; the movie has no shortage of memorable edge-of-your-seat action sequences. Though his trademark shaky-cam and lens flare effects sometimes distract from the action, the geek auteur does a solid job of keeping the film moving and creating some terrific set-pieces. 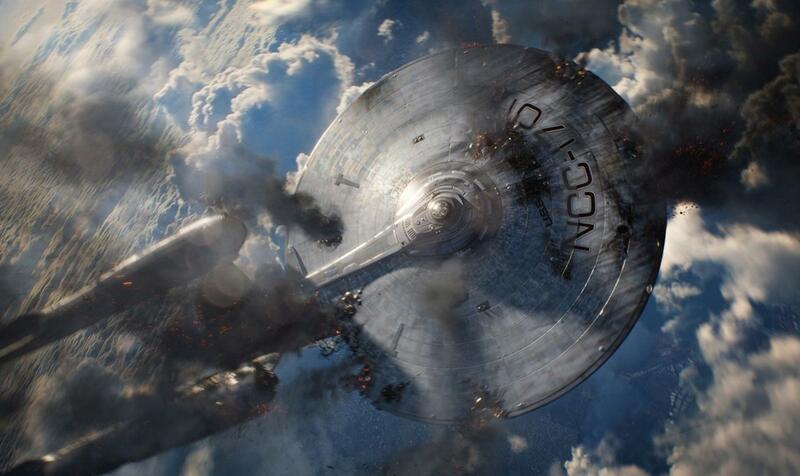 The Enterprise has never looked better, and Abrams’ future Earth, despite the presence of flying cars, is one of the most realistic to hit big screens in recent memory. The Great Gatsby – Baz Luhrmann’s lavish take on F. Scott Fitzgerald’s classic novel of love in the Roaring Twenties will certainly be a treat for the senses, but I’m optimistic that it will also highlight the story’s fascinating characters and remain faithful to Fitzgerald’s weighty themes of corruption, extravagance, and heartbreak. With actors like Leonardo DiCaprio, Carey Mulligan, Tobey Maguire, and Joel Edgerton on board, and Baz Luhrmann’s distinctive visual flair, this Gatsby is actually starting to look pretty great. DiCaprio looks perfectly cast as the titular Gatsby, a mysterious millionaire who embarks on an affair with the shallow, materialistic Daisy Buchanan (Mulligan). This adaptation has a lot of potential, and if it is received with the same adoration that readers still show the novel after more than half a century, Gatsby could be the runaway hit of the year. DiCaprio channels his inner Gatsby. 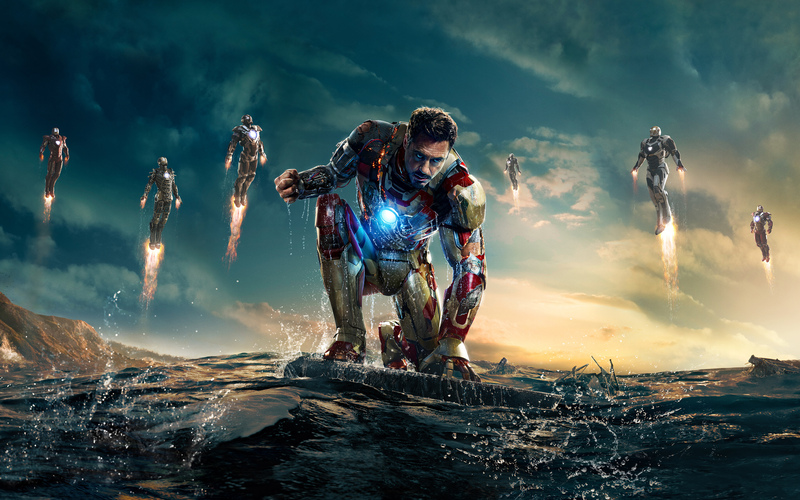 Iron Man 3 – In this, the third outing for Robert Downey Jr.’s Tony Stark, the man in the iron suit is confronted by his most dangerous foe yet, a mysterious terrorist called the Mandarin. As Tony’s personal world is torn apart by a ruthless foe, he embarks on a quest for vengeance. With Lethal Weapon helmer Shane Black at the wheel, Iron Man 3 is poised to erase the empty, dull spectacles of its predecessor with a more grounded, intense, and certainly dark storyline. When you look at the supporting cast, including Gwyneth Paltrow, Don Cheadle, Guy Pearce, Rebecca Hall, and (in an inspired bit of casting) Ben Kingsley as the Mandarin, Iron Man 3’s critical and commercial success are all but assured. A smaller but just as action-packed superhero piece might be just the kick Marvel needs to start its Phase Two group of films after the colossal grandeur of The Avengers. Tony Stark rallies his troops in this official concept art. Star Trek Into Darkness – It took long enough, but geek god JJ Abrams’ follow-up to his 2009 resuscitation of the Star Trek franchise is finally here. And, like Iron Man 3, JJ Abrams is taking the crew of the USS Enterprise on a darker, more serious adventure this time around. When an unstoppable terrorist attacks Earth and targets Starfleet, Captain Kirk (Chris Pine) and his crew track him to a war-torn world, where they find themselves fighting for their lives. The film’s ace in the hole is certainly its villain, played by Sherlock actor Benedict Cumberbatch, about whom Abrams and the rest of the cast have been strangely silent. Whoever Cumberbatch turns out to be (my money’s on a relation of Khan), audiences are in for an exhilarating space adventure. 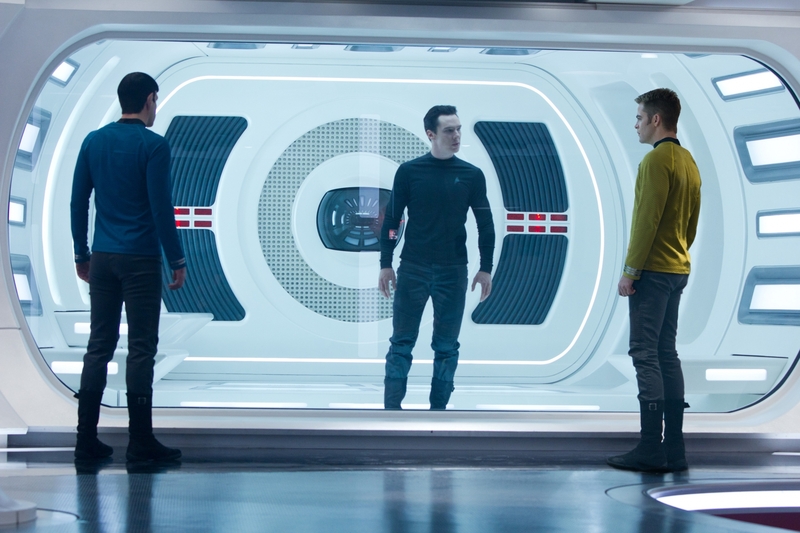 Spock and Kirk face off against new adversary John Harrison. 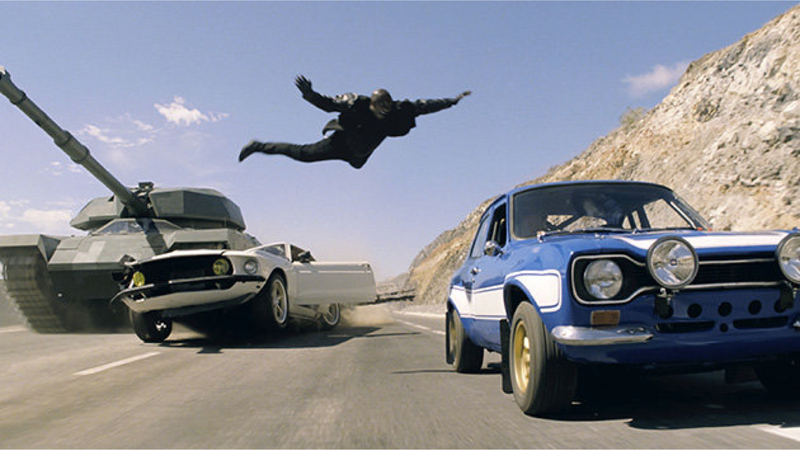 Fast and Furious 6 – Usually, I wouldn’t get excited for a Vin Diesel action vehicle, especially a sequel. However, the Fast series’ last two installments have been surprisingly solid popcorn flicks with originality and a gleeful devil-may-care feel. This time around, the series moves even further away from its street-racing origins, as Dom Torreto (Diesel) and his crew team up with former adversary DSS Agent Luke Hobbs (Dwayne “The Rock” Johnson) to take down criminal mastermind Owen Shaw. Torreto must try to keep his emotions in check when he learns that his girlfriend Letty (Michelle Rodriguez), whom he believed dead, is alive and working with Shaw. Expect another edge-of-your-seat blockbuster with flair to spare. A member of Torreto’s team takes a leap of faith.